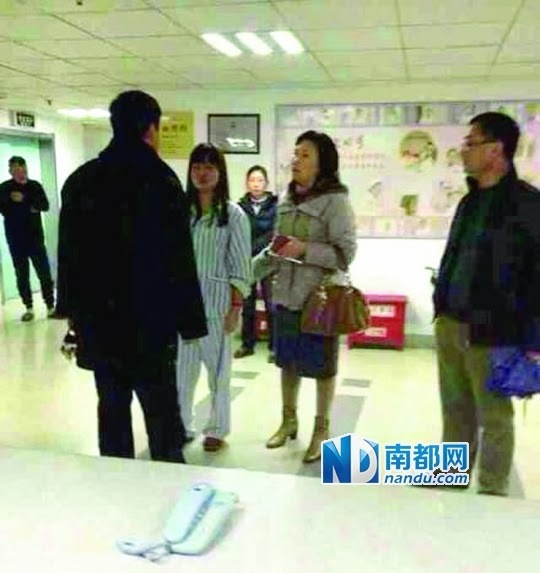 by MichaelWoodheadA dispute over male and female patients being forced to share the same ward is supposedly the cause of an attack by a senior Nanjing official on medical staff that left a nurse paralysed. A nurse has been severely injured in what has been described as a vicious attack by a senior female official who is head of the Jiangsu Science and Technology Institute. The incident occurred on 24 Feb at the Nanjing Stoma Hospital when a young man was brought in for emergency surgery for a bleeding cyst. Because the hospital was full and had few vacant beds, the young man was allocated to a female ward to recover from the operation, and was to be moved to a male ward when a bed became available. However, when he woke from the anaesthetic and realised where he was he called his family and they hurried to the hospital to demand that he be moved to a male ward. When a nurse said this was not possible she was beaten by the mother of the young man. The nurse was beaten with the handle of an umbrella and the attack was so violent that the handle snapped. The nurse received severe injuries to her chicest and was left paralysed in her legs and unable to move. A doctor on duty was also assaulted and severely bruised. The official is now under investigation by local police. However, the incident has been widely reported on social media sites such as Weibo, with many saying that it is typical behaviour from arrogant and privilege officials. The young man's father is an official in the Nanjing procurator's office and many doubt the injured nurse will see justice for those who attacked her.